Welcome back everyone, we are back with some more comic review goodness. This week we have 3 comics from the awesome people at Vibranium Comics and Games in Ocala Florida. Vibranium will be having some going back to school sales soon among their usual trivia nights and TCG game tournaments. Be sure to check out the Vibranium website to sign up for their emails and get awesome news about upcoming events and sales or just check them out on facebook. As always, the banner above is for facebook and below is for their website. Also as a new thing we here at DWP are doing, if you are enjoying my reviews and other blogs you can now leave a tip to help us grow and expand. By using the site known as Ko-Fi you can leave us the tip of a cup of coffee and all tips right now will be going to get some new updated software for our website. So, if you like what we do and would like to see our site improve, then drop by Ko-Fi and help us out at ko-fi.com/thalra. 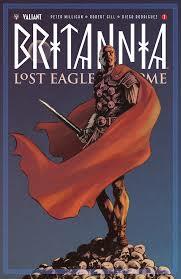 This first comic we have from Vibranium is called Britannia Lost Eagles of Rome. This was a very interesting comic about an ex-soldier that after being hurt was retrained to be the world’s first detective basically. Nero sent an army up into germany’s totenwald forrest and while there the amy lost a few golden eagle statues from their banners. Our hero of the day is sent by Nero to use his detective skills to find these Eagles. With him is a female warrior slave that he would want to be with if she wasn’t a slave, it seems he has higher morals than many though that doesn’t stop him in the past from having an affair with a senators wife. One of his biggest obstacles seems like it will be Nero himself as Nero wants him to go straight after the eagles by going off into the forest and our hero wants to use his detective skills which are sending him in another direction entirely. All in all, I found this to be an interesting mashup of themes between the detective comic and the Roman Legion storyline. Some might see this as a little slow, but I thought it was interesting enough the entire time. I can’t blame the ex-army man at having a crush on the warrior slave thats traveling with him as she is an action filled character. I also liked seeing how insane Nero seemed to be. The historical little tidbits helped make this an enjoyable story to read. Would you be interested in a comic like this? Have you read this one for yourself? If so what are your thoughts? Sound off below and let us know your thoughts. Also let us know what you would like to see in our upcoming reviews- more comics, movies, music, book reviews or something else? We made this site for you so let us know what you want to see! You know Roman story settings actually interest me, it’s interesting enough that it has a detective feel to it. Haha, I just have to point out on the morals. That’s always the case, we think one is all goody good until they disappoint us by taking into temptation, but I guess that’s how you make a story that sells right? I’d like to check this comic out for sure as the storyline fascinates me.